Easy Deposit – our network has over 600 ATH machines and more than 100 of them have Easy deposit for cash or checks. The Doral Online Banking service is available, as per usual, Monday through Friday from 7:00 a.m. to 7:00 p.m. and Saturdays from 8:00 a.m. to 3:00 p.m. 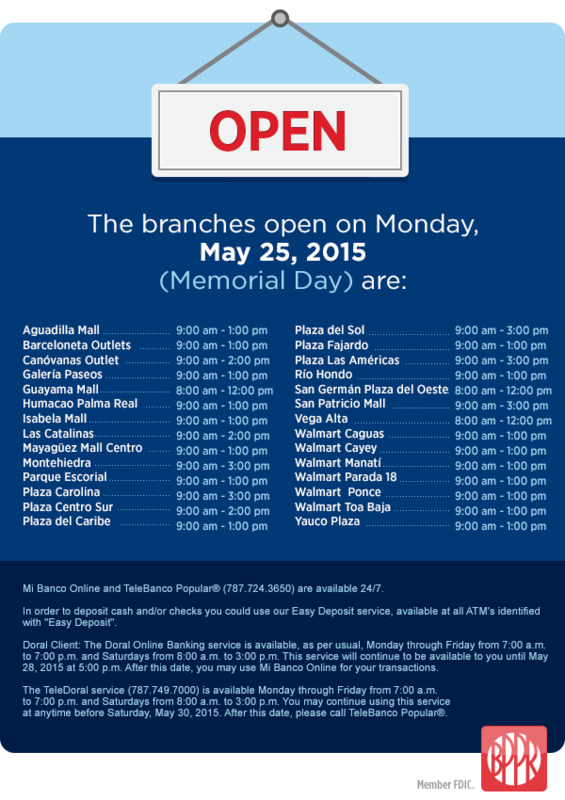 This service will continue to be available to you until May 28, 2015 at 5:00 p.m. After this date, you may use Mi Banco Online. The TeleDoral service (787.749.7000) is available Monday through Friday from 7:00 a.m. to 7:00 p.m. and Saturdays from 8:00 a.m. to 3:00 p.m. You may continue using this service at anytime before Saturday, May 28, 2015. After this date, please call TeleBanco Popular®.